Thom drew a histogram based on many orientations from a wide variety of sites (Thom MSB p 102, Fig. 8.1). The histogram showed peaks at certain relevant declinations:- possible lunar interest as indicated by the lunar crescent images, and more definite indications for declinations that could be interpreted as solar observations. 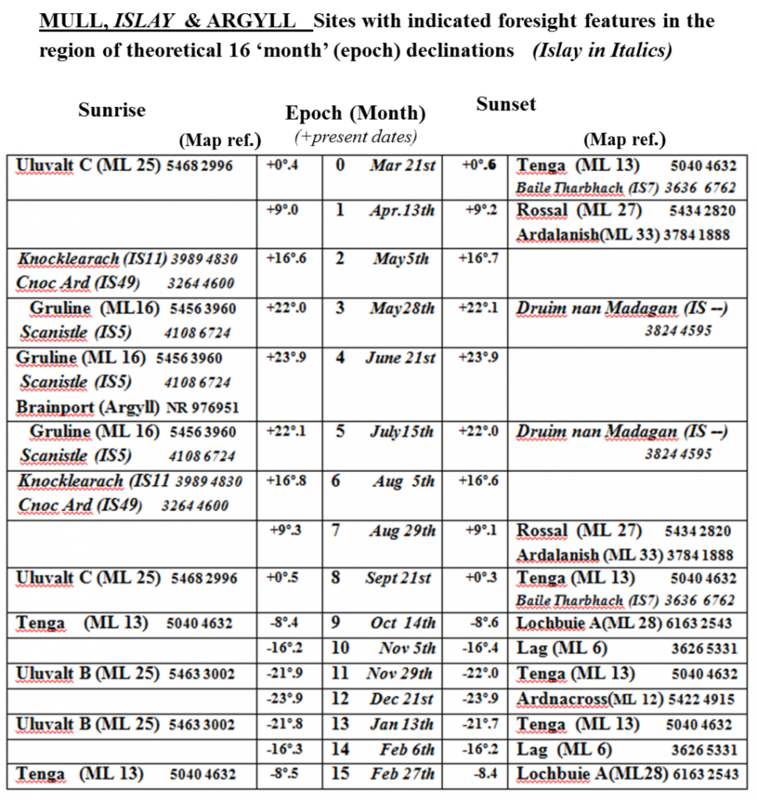 These are those marked as possibly being for the solstices, the 'quarter days' and the equinox. There were possible, but weaker, indications for intermediate relevant declinations. Identify the solstices. Then by counting days:- 2. find the mid points of the year by days - the 'equinoxes' 3. halving again, the 'quarter days' and 4. a possible further subdivision (the red marks). The sun is essentially stationary at the solstices with the greatest daily movement of the sun on the horizon at the equinoxes. Because the sun is moving, the expected declinations at sunrise and sunset are not the same. Other than at the solstices, there is no unique declination value - the sun is not in the same position on the same date the following year. At epochs 3, 5, 11 and 13 (i.e. before and after the solstices), the movement is small leading to the possible alignments for these as discussed above for Gruline (Mull) and Scanistle (Islay). For other epochs the foresight must, of necessity, be a non- precise one. The range is the four year change of declination for the day. Note that the equinox declination is predicted not to be zero unlike the modern astronomical definition. This is because the Earth is in a slightly elliptical orbit round the sun and so the two halves of the year do not have the same number of days. All assessable sites, bar 3 remote sites, in Argyll and on the Islands of Mull an Islay were measured. Most sites had more than one visit and the overall results are shown in the adjacent table. Most of these are illustrated and discussed above or in the sections on Mull or Islay. The relatively even spread of alignments. This suggests that few, if any, are due to chance. The pattern of the 'halving the difference' alignments discussed earlier show that they are very likely to have beeen planned. 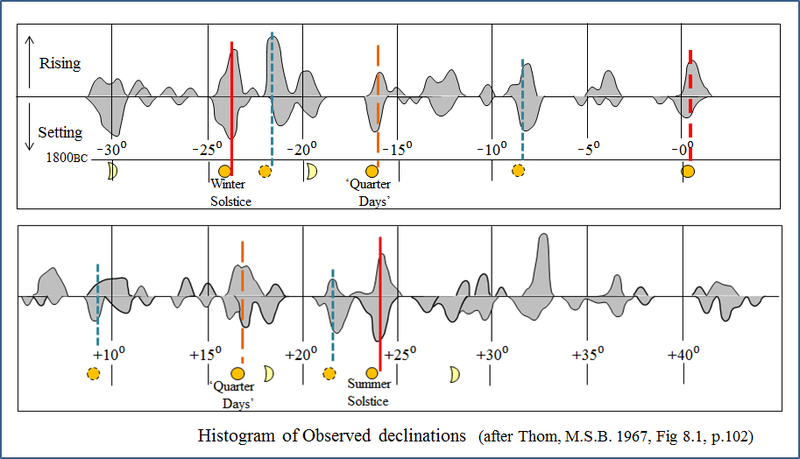 The declination of about 0°.4 for each of the three equinoctial alignments is as expected if the midpoint between the solstices were found by counting days. (See Thoms' histogram and predicted declinations above). 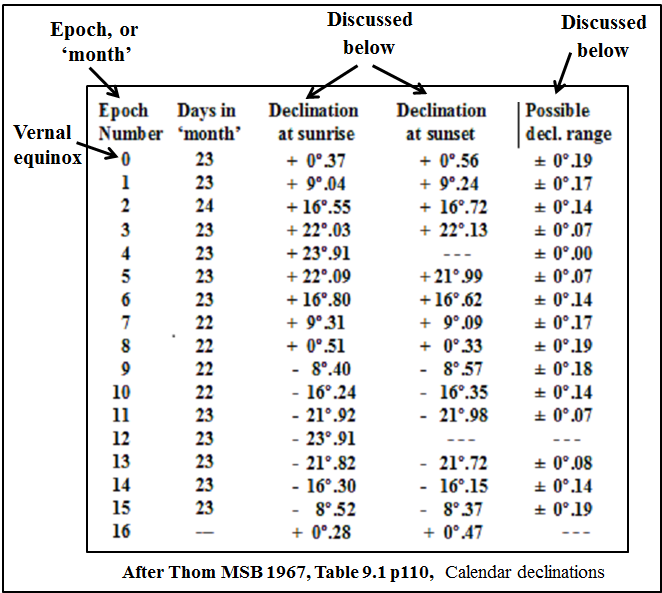 This provides significant evidence that a prehistoric solar calendar did exist and the assessments by Clive Ruggles discussed earlier and which were largely based on his reservations concerning Thom's Histogram of Observed declinations, can now be seen as probably overcautious. The gold lozenge was found when the Bush Barrow near Stonehenge was excavated in 1808. The range and quality of the artefacts found in the grave indicate that the man buried there was of high status. The grave has been dated to 1700 – 1900BC. The lozenge is inscribed with fine lines in a regular pattern. It has long been assumed that its purpose was only decorative. However it is possible that calendrical directions could be encoded within it (Thom et al., 1988). (The gold lozenge is too small and fragile for practical use and so if it does contain calendrical directions, it is likely to be a copy of a larger more robust field version; probably of wood.) The deduced epochs to the east are as shown. The lozenge has been inscribed with great care and although small it was possible to measure accurately the deduced directions. In use the lozenge would be oriented north/south and levelled. An alidade would presumably be used. Note that the epochs in ½’s are shown either side of the equinox and the epochs before and after the solstices are omitted. 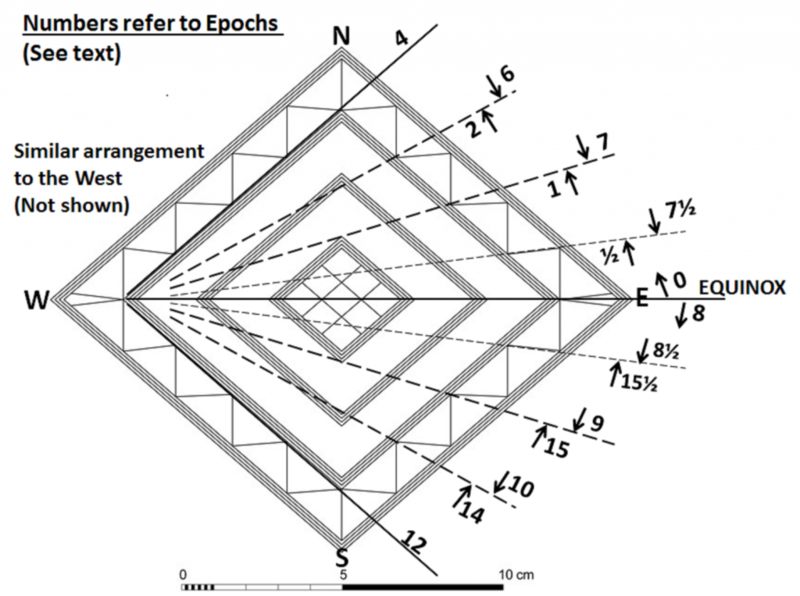 This allows use of the regular zig-zag pattern seen between the outer diamonds. North, although doubtful of its calendrical properties, has pointed out some lengths closely related to the megalithic inch (North 1996, 511ff.). The possible calendrical directions are correct to within about ± 0⁰.5. The acute angle at east and west is close to 81⁰ which is correct for the angle between the solstices near the latitude of Stonehenge. Using combinations of the vertices of the three outer diamonds the lunar standstill directions are also indicated. Drawing of K15 by Euan MacKie, reproduced with permission. In the past this has usually been described as being a sundial (Thomas 1988, Ruggles 1999, 129). 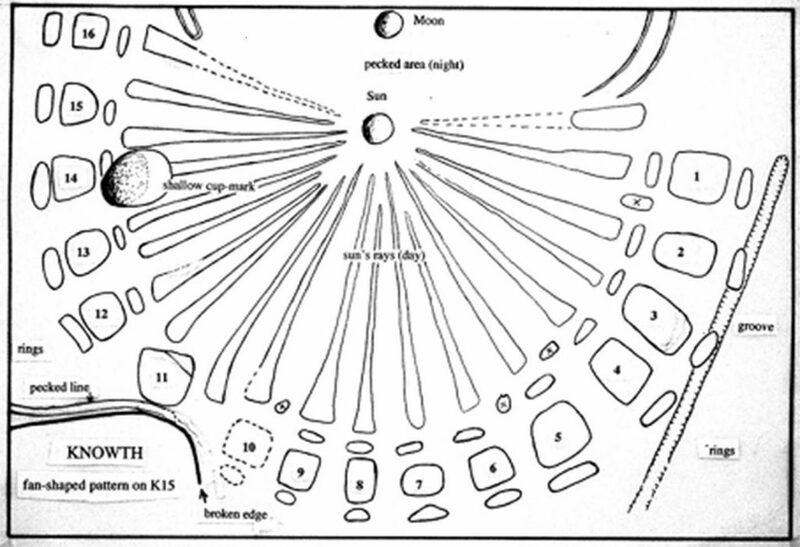 However a recent paper explains it as symbolising a solar calendar (MacKie 2013). Each numbered square represents 21 days. Each short groove above or below the square one extra day each. Top right is the vernal equinox. The stone is damaged at the lower left which leads to some uncertainties. Nonetheless there is close agreement of the day/epoch between Euan MacKie’s interpretation and Thom’s.